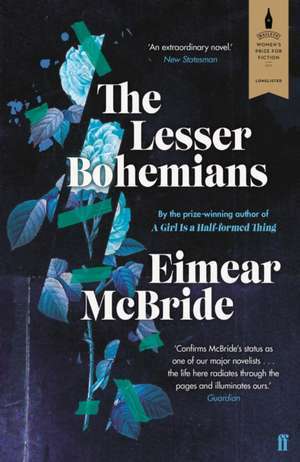 The Lesser Bohemians follows Eily, a first year drama student, newly arrived in London from Ireland, throughout the school year, though college is definitely not the focus. She is keen to experience all that student life in a big city has to offer, first on her list – losing her virginity. She succeeds in this aim when she meets an actor twenty years her senior in a pub and ends up back at his bedsit. Thus begins a tumultuous relationship in which she struggles with his habit of promiscuousness and when hurt does things that she instantly regrets. As the novel progresses they grow in emotional intimacy and we see the emotional damage that causes Stephen to struggle with letting love in. We are not told their names until quite late in the novel, Stephen’s especially comes so late that it feels almost awkward, but perhaps this is an attempt to indicate a better depth of knowing the characters. Alongside the disclosure of names there is also a shift to more access to dialogue between them, and the terms of affection that they use, perhaps an indicator of the move towards, and acceptance of, affection beyond desire. 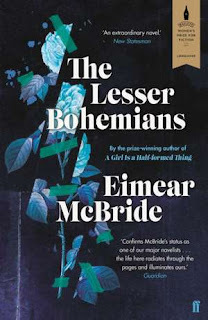 The narrative style is instantly striking, described by McBride as stream of experience rather than consciousness as it deals with far more than the mind. There is something poetic about the writing that sweeps you along in it. An entire book in a type of stream of consciousness would usually be far from enjoyable for me, but not so here, so expertly crafted that it feels entirely natural. Experiencing everything as Eily does gives us a real sense of intimacy with the characters and a rawness to the emotions. When it feels that disaster is being foreshadowed your heart will break at the thought of it. Stephen is kind to Eily on their first night together, her beliefs about his desire causes a souring in relations, but he still shows a level of care in the morning. They seem to constantly be hurting each other at just the moment the other makes a real effort, but underneath it all there seems genuine affection. The way Stephen treats Eily is at times difficult to watch, especially when we see how it impacts her beyond their time together. Despite the difficulties they seem drawn to each other, and you do find yourself rooting for them to find a way to happiness together. A beautiful, intriguing novel, recently revealed to be the first of a trilogy. It feels complete as it is, but I doubt I’ll be able to resist the sequel.